BenQ America Corp introduced the Colorific i500, a compact device that combines wireless streaming, short-throw LED projection and rich integrated audio. BenQ's i500 delivers big-screen entertainment designed for today's modern, tech-friendly lifestyles. With access to the most popular apps, the i500 opens possibilities for thousands of movies, shows, apps, games and even live broadcast — all without cables, set-top boxes or streaming dongles. 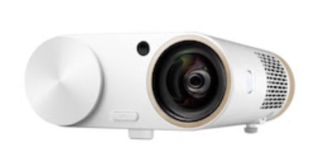 "The i500 smart projector is an entertainment game-changer," said J.Y. Hu, vice president at BenQ America Corp. "At just 3.3 pounds and 3 inches tall just about the size of today's tablets, the i500 is a powerful and versatile device for even the tightest spaces. Simply turn on the i500 and you're ready to stream videos and music wirelessly for the ultimate big-screen experience anywhere." The i500 projects images up to 80 inches from as close as 3 feet from the wall or screen, enabling supersized movies, shows, apps and games in WXGA (1280 x 800) native resolution. Supporting a variety of streaming content, the i500's Colorific technology features a LED light source rated for 20,000 hours without lamp replacement and is capable of projecting high-definition videos with supreme clarity and sharpness. Its vertical keystone correction means the projector can be placed at an indirect angle without any distortion. On the other side of the dual-sided device users will find a pair of 5W fine-mesh-covered chambered speakers specially tuned to produce clear voices and rich sound quality without external audio connections. When the i500 is not projecting, it can double as a portable Bluetooth speaker system. The i500 comes out-of-box-ready and maintains its performance with the latest software and streaming apps via over-the-air live updates to provide years of unlimited hassle-free entertainment. It is preloaded with popular streaming services and apps such as YouTube, Spotify, Vimeo, Netflix, Hulu and many others.